Hundreds came to see the three most visible candidates of Bangalore Central standing for the upcoming Lok Sabha Elections 2019. 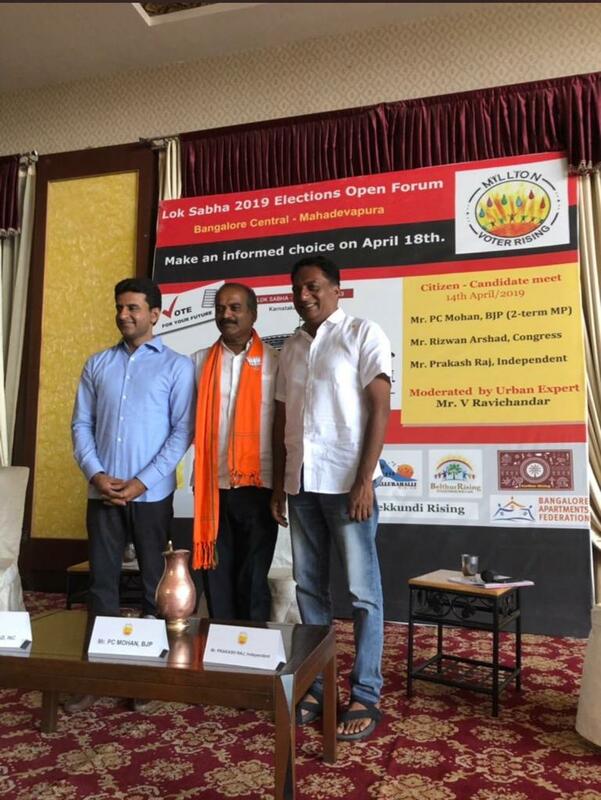 Prakash Raj (Independent), Rizwan Arshad (Congress) and PC Mohan (BJP) shared the dais at the Million Voter Rising campaign initiated by Whitefield Rising in partnership with citizen groups across Mahadevpura (Bangalore Apartment Federation, Belathur Rising, Bellandur Forum, Bellandur Jothege, Doddanekkundi Rising, ForceGW, Nallurahalli Rising and Varthur Rising). The Open Forum was an opportunity for citizens to ask pointed questions to each candidate. Ravichander, Urbanist, facilitated this session, handling the topics sensitively, articulately and respectfully. PC Mohan, the two term incumbent from BJP who has always been approachable, cordial and supportive of his constituents spoke about some successes he has had with inching forward the big suburban rail dream – an essential for traffic to ease up! He lamented about the traffic situation and said Mahadevpura needs its own masterplan for mobility. When asked about the concerns around the polarizing situation in the country, he clarified that both he and the party were in favor of communal harmony and cited that he had constituents of all religions who have been supporting him. A key question posed to him was: At the Parliamentary level, why is there not a stronger city level decentralisation constitutional amendment, which is stronger than 74th amendment. PC Mohan responded that if all parties were in agreement, he too would support the demand. He also stated that he would aim to get more funding from Centre to solve the many issues faced by citizens of Bangalore. Rizwan Arshad from Congress is not new to the constituents though he has never been elected here. As an MLC, he has been engaged at the grass roots level in this constituency, and has worked on multiple solutions including the ordering of a Mini STP plant model, which if successful can be replicated across the city, rather than the current model of dependence on one large STP to clean the waste water before it enters the lake eco-system. Rizwan started his dialogue emphasizing that he would have preferred to have a debate on the issues, however, he used the time given to detail the changes he intends to bring about: 1) Structural issues with BBMP needs to be fixed for governance, 2) Focus on the city and provide a voice at the parliament to get focus and funds, 3) No sanctions for building without necessary infrastructure – systematic development is the need and 4) More legislation like RTI needed to allow citizens to be more aware and have a voice to fix trust deficit. Prompted by a dialogue on the potential trifurcation of BBMP, he agreed that Mahadevpura does need its own governance – possibly an elected mayor. Emphasizing that a stable government is needed, he wore his party badge proud on his sleeve citing that 550km SWD has been constructed, seven waste to energy compost plants have been built, and that 79% of waste water is now treated, from the earlier 35% in the city. Prakash Raj is a very well-known actor standing as an independent who joined politics to affect change in the electoral process and to drive participative governance. He talked about the fact that the constitution enables an elected representative to be able to perform their duties without any party affiliation, adding that MPs have authority to question at any level of government and ask for transparency. Not a politician by profession, he came prepared with a manifesto, with a plea to all to understand his vision which stresses on systemic change rather than a reactionary band aid fix to all the problems we are seeing. He emphasized that deep systemic changes needed to be made and that clear vision to address the unorganised sector of workers, education for all children and water scarcity issues we face in the city. His top goal is to focus on job creation as the basis for development. Questions for the candidates were collected and curated during the registration process. It was observed that many of the questions submitted were related to BBMP issues such as water, streetlights, roads and such. The frustration with basics being unavailable in Mahadevpura was evident and loud even though this is an MP election. Six years ago Whitefield Rising spawned a non-partisan citizen movement to make our neighborhoods better. It didn’t take long to figure out that it was not the lack of funds or availability of solutions that was the problem. It was about politics, lack of transparency, accountability and competence. To address this, the Million Voter Rising campaign was launched so that citizens could be encouraged to become informed, vigilant and most importantly, Vote! When educated voters demand governance and one is unable to “buy” their vote or rest on party laurels, the elected representative will be forced to perform or voted out. The hope is that parties will field better and better candidates for Mahadevpura knowing that our vote is informed and not for sale. Million Voter Rising has enabled thousands of disenfranchised voters get on the electoral rolls and will continue to address challenges such as voters deleted from the rolls! As we returned from the venue and faced traffic, dust, air pollution, garbage heaps and open drains in the summer heat, we reflected on the common man who did not have the luxury of sitting and listening to the dialogue in an AC hall and hoped that the elected candidate will sincerely work for the improvement of our area.